University of Delaware students, faculty and alumni won awards at the 2017 American Institute of Chemical Engineers (AIChE) annual meeting, which ran from Oct. 29 to Nov. 3 in Minneapolis. Thomas Gartner, a doctoral student in the Department of Chemical and Biomolecular Engineering, won first place in the Materials Engineering and Sciences Division (MESD) Graduate Poster Awards. His winning poster was titled: “Influence of Molecular Design on the Self-Assembly of Single-Stranded DNA Amphiphiles.” Gartner is part of associate professor Arthi Jayaraman’s research group. 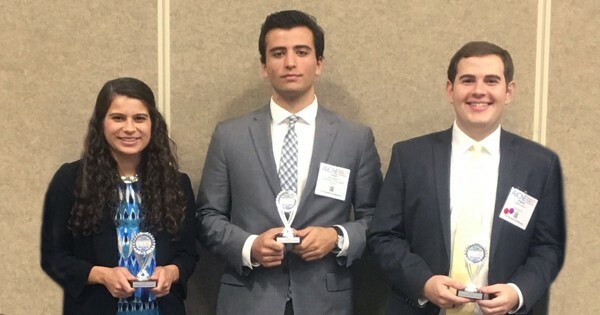 Three UD students won awards in AIChE’s Undergraduate Student Poster Competition. Victoria Muir, a senior majoring in chemical engineering, won first place in MESD division for her poster titled: “Efficient tuning of siRNA dose response by combining mixed polymer nanocarriers with simple kinetic modeling.” She does joint research in the labs of Thomas H. Epps, III, Thomas & Kipp Gutshall Professor of Chemical and Biomolecular Engineering and Professor of Materials Science and Engineering, and Millie Sullivan, Centennial Junior Professor of Chemical and Biomolecular Engineering. Trent Simonetti, a senior majoring in chemical engineering, won first place in the Catalysis and Reaction Engineering division for his poster titled: “Catalytic Hydrodeoxygenation of Renewable Oils to Diesel-range Hydrocarbons Using Ir-ReOX/SiO2 Catalyst.” His mentor is Sibao Liu, a postdoctoral researcher in the Catalysis Center for Energy Innovation. Rob Cipolla, a senior majoring in chemical engineering, won second place in the Food, Pharmaceuticals, and Biotechnology division for his poster titled: “Elucidating the Metabolism of Sulfolobus solfataricus using 13C Metabolic Flux Analysis.” He does research with Maciek Antoniewicz, Centennial Professor of Chemical and Biomolecular Engineering. A UD adjunct professor and a UD alumnus also received awards at the 2017 AIChE Annual Meeting. Richard Grenville, an adjunct professor in Chemical and Biomolecular engineering, won the NAMF Forum Award from the North American Mixing Forum. This award is given for excellence and sustained contributions to mixing research and practice. Grenville is director of mixing technology at Philadelphia Mixing Solutions. Rakesh Agrawal, who earned a master’s degree in chemical engineering from UD in 1977, won the Alpha Chi Sigma Award for Chemical Engineering Research. This award recognizes an individual with outstanding accomplishments in fundamental or applied chemical engineering research carried out in the past 10 years. Agrawal is the Winthrop E. Stone Distinguished Professor of Chemical Engineering at Purdue University. His research focuses on the fabrication of low-cost solar cells based on nanotechnology.